At Ontario Animal Hospital, our compassionate, experienced veterinary care team is committed to putting the well-being of your pets first each and every day. As a full service animal hospital, we strive to keep your pet healthy and active through proactive, preventative care. 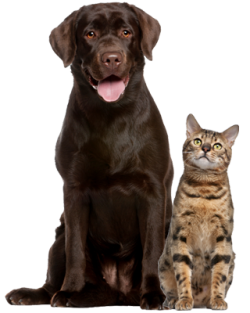 We provide comprehensive pet care for dogs and cats, including dental care, pet surgery, pet vaccinations and more. Our hospital puts the latest veterinary technology to work for you and your pet, helping dogs and cats live longer, healthier and happier lives. Ontario Vet Puts Your Pet First for a Healthier & Happier Life! At OVH, our care philosophy is simple: preventative care is the foundation for true wellness! Regular check-ups, screenings and exams are the best way to detect the underlying symptoms of illness before your pet’s health is adversely affected. Checkups are also an important opportunity to ensure that your pet is up to date on all core vaccinations and that additional vaccines are not necessary, depending on your pet’s lifestyle and activity levels. OVH recommends an annual dental cleaning to protect your pet’s oral health. Gum disease is one of the most common and overlooked illnesses affecting pets that can cause more damage than just tooth loss! Bacterial infections that enter the bloodstream can affect your pet’s internal organs, leading to serious health problems. An annual cleaning will help keep your pet’s gums and teeth healthy for years to come, while reducing the risk for oral health problems. In addition to wellness exams and pet dentistry, OVH provides pet surgery and advanced diagnostic care. We utilize the latest technology, including digital radiography and ultrasounds, for highly precise and accurate diagnostic exams. We understand that if your pet is sick or in distress, every minute matters. Thanks to our advanced technology, we are able to quickly and accurately diagnose potential problems and immediately take the necessary steps to protect your pet’s overall health. Our veterinary hospital is a warm, welcoming and kid-friendly. We strive to keep our waiting room as calm and soothing as possible to minimize any anxiety or distress your pet may be feeling from a vet visit. We take extra time at each appointment to answer all your questions and address any concerns that you may have. We strive to educate pet owners on how to keep their pets healthy year round, including good nutrition and exercise. Whether your pet is visiting us for a routine procedure, check-up or surgery, we treat all pets with compassion and kindness. We look forward to meeting your pets and welcoming them into our veterinary family. For more information about our pet care services or to schedule an appointment, contact OVH today at 909-984-2211. You can also use our online appointment request form to schedule your next visit with our OVH – be sure to mention our new client offer to receive a 50% off their FIRST examination of their pet!